Kids With Food Allergies (KFA), a division of the Asthma and Allergy Foundation of America, hosted a webinar on December 1, 2015 called Current Topics in Food Allergy Law. Our webinar featured the Allergy Law Project. The Allergy Law Project is a blog run by three lawyers, all of whom have personal experience with food allergies: Laurel Francoeur, Esq., Mary Vargas, Esq. and Homa Woodrum, Esq. 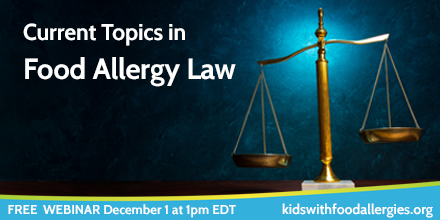 KFA thanks Allergy Law Project for generously donating their time to prepare this webinar. We also thank Sanofi for providing an unrestricted sponsorship to KFA for this presentation. Allergy Law Project answered a question after the webinar about what accommodations restaurants have to make for people with food allergies. Most restaurants are considered “public places” under Title III of the Americans With Disabilities Act and therefore have to accommodate people with disabilities. A disability is a physical impairment that substantially limits one or more major life activities. The determination of whether a person has a disability is established on a case-by-case basis. What would those accommodations look like for a person with food allergies? So if a restaurant usually changes its menu for customers with dietary needs, it may also have to make changes for people with food allergies. However, if the alteration is overly burdensome (like using separate equipment or expensive ingredients), the restaurant may not have to make any changes. If you are fortunate to live in a state that has food allergy restaurant legislation (such as Massachusetts or Rhode Island), you can expect a little more attention. In those states, restaurants are required to have at least one staff member trained in allergy awareness, display posters describing food allergies, and must post on their menus that customers must inform the staff of their allergies. Although they have more allergy awareness, they still may not have to make changes to their menus. Are customers with food allergies allowed to bring in outside food? For the answer to that question, please check the Allergy Law Project page in a few weeks! Visit our new mobile-friendly community and find the help you need quickly and easily! A must-have, step-by-step guide to preparing for a safe school year. Connect with Laurel Francoeur, Esq., Mary Vargas, Esq. and Homa Woodrum, Esq. The 2015 State Honor Roll of Asthma and Allergy Policies for Schools describes states with the best public policies regarding school management of asthma, food allergies, anaphylaxis and related allergic diseases. Research, advocacy and educational resources. AAFA is the nation's oldest and largest nonprofit for allergic diseases. Find a board-certified allergist via the American College of Allergy, Asthma & Immunology (ACAAI). Find an allergist in your local area via the American Academy of Allergy Asthma & Immunology. YOU MAKE OUR PROGRAMS POSSIBLE! You enable us to give families managing food allergies the information they need to keep their children safe and healthy. Please give generously! Interesting to listen to and the lack of understanding how sensitive kids are when you apply this to food allergies. there should be no such thing as 'trusting' someone else - some stranger - w/ your kids life. researching brands that are made in nut free facilities takes a TON of work and there is no way I would assume some random person in a kitchen would do this even if well intentioned. the nuances of food allergy labeling etc - not well known.